Meranda Writes » Blog Archive » What do you say about suspected plagiarism? « Does this make me a horrible journalist? What do you say about suspected plagiarism? As we continue to follow the recent floods up here in northwest Indiana, I’ve been called on to pick up random stories here and there. (Not so much random, but between beats kind of things.) Today it was the arrival of FEMA to assess the damage. 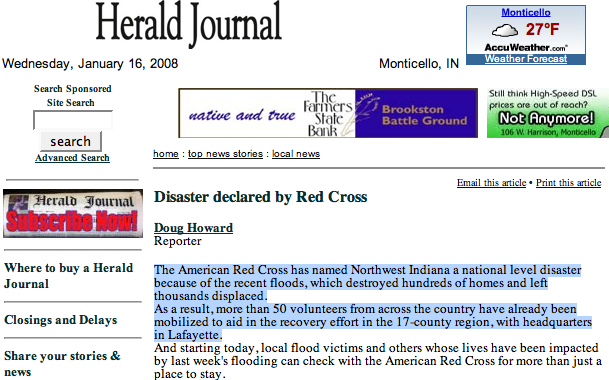 Yesterday, it was about the American Red Cross naming the region a national level disaster. A version of the charticle that ran in today’s paper was originally posted yesterday (Tuesday night) as a breaking news item. A version of my story was out on the state wire around 1 p.m. today (Wednesday). Now, today, I was charged with kind of picking up all the pieces for a comprehensive “This is where we stand” update for Thursday’s paper. My editor handed me a story printed off the site of the paper in one of the small cities to our north, which was one of the worst affected spots. It included comments about the Red Cross efforts in that area, which he wanted me to check into. I set it aside as I made some other calls and tried to rein in other sources and wrap up another story. About half an hour later, I picked the print out up and noticed something that piqued my interest. It sounded familiar. Really, really familiar. The American Red Cross has named Northwest Indiana a national level disaster because of the recent floods, which destroyed hundreds of homes and left thousands displaced. As a result, more than 50 volunteers from across the country have already been mobilized to aid in the recovery effort in the 17-county region, with headquarters in Lafayette. When I wasn’t just trying to get the story up, and I was smoothing it out for print, I realized I needed to specify it “left thousands of residents displaced.” Otherwise it sounds like it displaced homes. I also fixed the incorrect capitalization on northwest Indiana. Small technicalities. But seeing the same technical mistakes in the other story made me suspicious. So I brought up my online update and compared the familiar-sounding lead. I don’t know if I can sum up in words how utterly shocked I was to discover the first two paragraphs of that story were identical to the first two graphs of my update. I mean, word for word they must have been copy and pasted. Go back and look again. I had to. At first, my instinct was, maybe the wires picked it up and they just took that to top their story. But then I checked, and as I said before, it wasn’t on the wire until 1:12 p.m. I had the print out before then. Plus, the wire story further cleans up my lead. I also noticed the story doesn’t attribute anything to the Associated Press or even “Wire reports,” and it certainly doesn’t mention the J&C. I mean, wow. I was pretty much speechless. This stuff doesn’t happen. Does it? Nobody’s that dumb. Are they? This is plagiarism, right? I’m not confusing my journalism terms or just annoyed that guy took credit for my haphazard sentences and reporting. I mean, this is not OK. Right? On one hand I have the inclination that I’m sure we caught them off guard because we got the news late in the day and posted it after the Red Cross had closed. Therefore, they likely couldn’t independently confirm what they read on our site. But they didn’t even attempt to rewrite around it. There was so much other, (presumably) original reporting in that story. Why would you top it off with someone else’s lead, especially if that someone else covers your region and will likely stumble across your story? I don’t get it. I mean. Who does that?! The next question, I guess, once I reconcile my feelings is… What do you do with something like this? I pointed it out to my editor when I realized. I don’t know what he will do or has done. I asked him, jokingly, what he’d do if we just took two paragraphs from another paper, and his comment was simply, “I can’t fire a (the other paper) reporter.” I’d expect to be and hope I would be fired for doing that. So I guess my question is, what would you do? One of the other reporters suggested I e-mail the reporter directly to ask about it. But I don’t know. It’s probably one of those things best left to the editors. 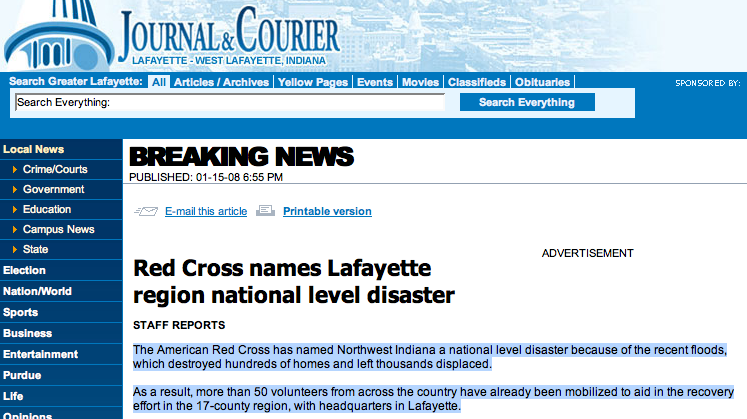 This entry was posted on Thursday, January 17th, 2008 at 12:20 am	and is filed under Commentary, Journalism, Lafayette, Offline, Question, WTF. You can follow any responses to this entry through the RSS 2.0 feed. Responses are currently closed, but you can trackback from your own site. I think it’s right to tell your editor, but I’m also a believer of working it out among the “kids,” and getting an explanation before making an accusation. It certainly appears as though you were plagiarized, but it doesn’t seem right to run the reporter up the flag pole this way without more facts. If he did do it, he should be canned. Or, if he’s so green as to deserve a little pity, made to understand just how cracked the ice is beneath him. Hey Matt — I wasn’t trying to “run the reporter up the flag pole,” I’m just trying to figure out what to do. I made a conscious decision not to write his name or the city here so it wouldn’t say pop up in any searches for him down the line. But it is on the screen grab so you can see the similarity and that it’s obviously under someone else’s byline. I’ll talk to my editor again today and see what he says. Part of me thinks, let it go. But that’s how things like this perpetuate. Plus, then the guy will never realize his error if he is “green.” But even if he is, I’m inclined to think he should know better. I first learned about plagiarism writing reports in like 4th grade. It looks like a case of pure and simple plagiarism to me. If a student did this in my class, I would fail the student — for the whole course. If I were a newspaper editor and this were my reporter, I would fire him. And I would make a big public case out of it so everyone in the newsroom understood what had happened and why I have zero tolerance for plagiarism. If you can’t do your own damn reporting and write your own text, then you do not deserve a job in journalism. There are plenty of people looking for work who know how to do the right thing. Give one of them this guy’s job. P.S. I would also (if I were the editor) phone the journalism department chair at this reporter’s j-school and ream the chair out. That way maybe the j-school would do a better job of teaching their students the difference between right and wrong. His name is (deleted) it’s there on the screen capture. And Mindy, I agree he looks guilty, but aren’t we supposed to be in the practice of not assuming thing? I suspect your newspaper has a policy about this kind of thing–I don’t know of any that don’t. Put it in their hands. Tell your editor and let the powers that be handle this. I remember when I was a young reporter just out of the box and it’s tough to play whistleblower. But, if there is a written policy at your paper–follow it. That’s why it’s there. That’s how I’d tell my students to handle it. I love Mindy’s tenacity, as plagiarism is a problem, but it’s not your *personal* problem. Wow, I would have e-mailed that reporter right after my blood stopped boiling, and I would have cc’ed my editor and his/her editor, if you could find out who it is. It would have gone something like this: “Dear Blahblabh — This is Meranda Watling, who is reporting on the floods in Indiana. It has come to my attention that it appears as though a recent story you’ve written has a lead identical to one I’ve written. I do not appreciate my work being used verbatim without crediting me. If you’d like to discuss this further, you can reach me at …” And such. That’s just crap, Meranda. Keep us Meranda Writes readers up to date with what happens, if anything. Good luck! *sigh* Well I’d say you did the right thing going to the editor. I might suggest a cross between what Jaclyn said and what you did. Write up something outlining all the facts as you know them. Track down the contact info for the reporter and his boss and then give everything to your editor. That way your boss is part of the initial contacting process, but doesn’t have to do the initial legwork. I actually had a (kind of) similar situation. We were running a story from a sister publication and I ran into a question while editing it. So I found the press release for the event online … and everything but a couple sentences was verbatim from the press release. The paragraphs were arranged in a slightly different order, but still said the same thing. Now a PR firm isn’t going to care if you copy their release — they usually are tickled pink to have people regurgitate their canned material. But the kicker was the guy had the audacity to give himself a byline. And his publication had already run it, byline and all. ack! Unfortunately my boss never really did anything about it because of office politics. grr. Not really sure what else I, or you, can do in a situation like that. My colleague Cory Armstrong is correct — the right action for a young reporter to take in this case is to tell her editor, do whatever the editor advises or prescribes, and chalk it up to bad journalism practices at another newspaper. It’s true that you could e-mail everyone personally, but that’s probably not the best option. Ah sorry all (and thanks Matt for bringing it back to my attention). My days at work spiraled out of control on other stories on my beat, so I didn’t come back and update as I should have. I took the advice and asked my EE about what if any policy we have and presented her with the evidence and print outs. She said to keep an eye out and see if it’s an isolated incident made because the person didn’t know better (which happens I suppose — she gave an example of a co-worker in Kansas who honestly didn’t know better until she was told). She said she might e-mail the guy’s editor to note that one of her reporters noticed a story with an identical lead. I also asked one of our other editors who, a few days later, it dawned on me used to work as ME of the paper in question. Her immediate response? “It doesn’t surprise me.” And that, “He did it because he didn’t think he’d get caught.” Sigh. My direct editor meanwhile has taken it in stride and humor, as he does most things, and helped me to do so. He joked that my productivity recently has been low: He hasn’t seen any of my stories in the HJ. lol. Well, it was a little funny. Another reporter, when I spoke up, said he had noted a similar thing in a different paper in our region for one of his stories. He didn’t really do anything about it but chalked it up to bad journalism, which is kind of where I’m leaving this. So all this leads to a whole lot of nothing. No guns blazing. No apologies demanded — or received. That story remains posted as it originally appeared under another reporter’s byline. And I have moved on, as I indicated before, to doing my best at my job and letting my work speak for itself — I guess even if it’s through someone else’s mouthpiece. As a final note, I do think I would feel a lot differently and more outraged — though my outrage has diffused in the past week — if this had been an enterprise package or something I spent more than about half an hour reporting and writing. As it stands, kind of like when I see the TV or radio people reading near word-for-word a story I reported, I just chalk it up to a small market and thank God I work at a more professional paper than that.